Conventional wisdom says that buying a home is a smarter financial decision that renting. However, homeownership is a huge decision, and it can be an expensive option. Owning a home is not for everyone, and for some, renting can actually be the more cost-effective choice. That's certainly the case for me. Despite earning a good income, my husband and I have decided to rent for the foreseeable future. Here's why it makes sense for us. We live in one of the most highly-desired towns in the Central Florida region. A single-family, 1,200 square foot home in our neighborhood starts at $350,000. Even if you do find a home at that price, they often need significant improvements to be livable. Typically, houses in that price range need new roofs or foundation work. If we put 20 percent down on a home — a whopping $70,000 — our monthly payment for the mortgage, insurance, and taxes would be about $1,600 a month. Besides coming up with a huge down payment, that's a high monthly bill. While the housing market is extremely competitive in our neighborhood, rentals are much more affordable. We rent a large two-bedroom apartment with granite countertops, stainless steel appliances, hardwood floors, and resort-like amenities for just $1,300. And we didn't have to come up with a large payment to move in. The lack of affordable housing is a nationwide issue. Particularly in areas like New York City or San Francisco, buying a home can be out of reach for most Americans. 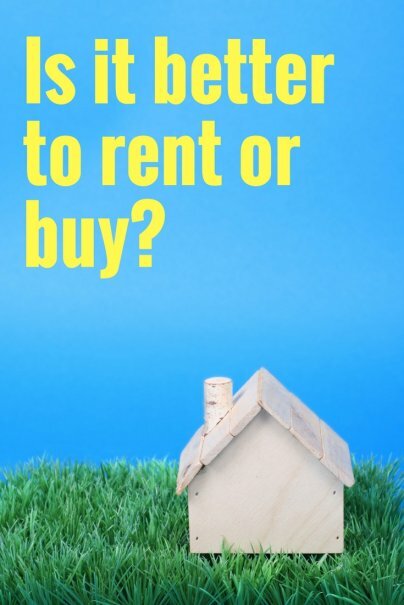 In those cases, it can make more sense to rent than buy. If we were to buy that $350,000 home, the down payment and monthly mortgage payment would be only a small portion of our home expenses. We'd have to budget to prepare for other expenses, like emergencies. If the roof needs repairs, or if the appliances break, we'd have to cover the cost of the replacement. Houses are often touted as a good investment. However, the recession of 2008 showed how flawed that idea was. There's no guarantee that a home's value will increase over time, and there is a chance it could decrease. The homes that go for $350,000 in our area sold for $500,000 pre-recession. But in 2008–2010, those same homes plummeted to under $180,000. For homeowners who took the plunge to buy, they lost a lot of money and either saw their bank foreclose on their homes or are still underwater. Homeownership scares me because it feels permanent. Of course, you could sell the home if you need to move, but that process can be long and complex. And you can end up losing money on the deal. Renting gives me more flexibility. If an opportunity pops up on the other side of the country, I just have to pay to break my lease and am free to leave. Having that option is reassuring in a sometimes tough job market. If homeownership is your goal, you may have to sacrifice other things to make it possible. To save for a down payment, you may have to cancel your retirement contributions, or take money out of your emergency fund. Contributing the maximum to my 401(k) and building my emergency fund are important to me. Because buying a home would mean postponing those goals, home searching just isn't in the cards. Whether or not to buy a home is a very personal decision. While many say that homeownership is essential for financial security, it's not the only option available to you. Depending on your circumstances, renting can give you more disposable income each month and more freedom to pursue your other goals.